Launch of Rhyl Cycle Bridge: The official opening of the Rhyl estuary Pont y Draig shared use cycle bridge will take place on Tuesday 22nd October 2013 at 2pm. Mark Colbourne MBE, winner of one gold and two silver medals at the London 2012 Paralympics, and Leon Jones from Ysgol Maes Owen will be the guests of honour. Rhyl Rotary Bikeathon will be held on 15th September 2013 in aid of the three north Wales hospices. There are 3 rides of different levels to choose from - inexperienced, intermediate and experienced. For details click here. Burton Marshes - New Cycle Route 568 links North Wales and England. After long delay, this symbolic cycle route linking England and Wales across the Burton Marshes was officially launched on Thursday 18th July 2013. Cycle Round Snowdon on Sunday, 26th May and help raise money for the children's hospice Ty Gobaith. Click Ffestiniog 360 for details. Clwb Beicio Menai: The world is alive with the chuckling of cycle gears. See what’s happening in Caernarfon. Cycle Hubs on Holy Island: Some of Wales's finest coastal scenery is to be found on Holy Island which is linked to Anglesey by Four Mile Bridge and the Stanley Embankment. Cybi Bikes now offer the opportunity of exploring the delights of Holy Island by providing 5 new cycle hubs where bikes can be hired and dropped off together with four recommended routes of varying length. For details click here and here. Elsewhere on this site we have photos of Holy Island. Welsh Government’s White Paper on Cycling Walking Routes. There is news for cyclists on the Wirral wishing to use as little as possible of the hazardous Hoylake–Chester high road (A540) on their way to North Wales. The long awaited Project for the Neston – Deeside Cycleway has received funding. This is to replace the old route, used many years ago, across Burton Marshes to Deeside and RAF Sealand, which was closed down by the MOD several years ago for safety reasons (the old route used to go through the Firing Range). Sustrans has received £8 million to fund 5 Cycling/Walking projects in the North West. £250K of this is for the Neston to Deeside Cycleway/Walkway. Helping Cancer Research: On Sunday, 6th May 2012 there is a charity cycle ride in aid of cancer research at Clatterbridge hospital. The ride has three routes of 15, 50 and 100 miles starting in Hope near Wrexham, with the longer rides taking in some amazing scenery in North East Wales and Cheshire. Full details can be found at the Circle of Hope website. On Thursday, 16th February 2012, the Conwy Cabinet agreed that desegregated cycle access to the promenade be permitted for a trial period of one year. This followed a unanimous recommendation by a Task and Finish group appointed by the council’s Community Scrutiny Committee. The vote in cabinet was 6-2 in favour of the trial with Cllrs Philip Evans and Graham Rees voting against, as did Cllrs Linda Groom and Ken Stevens in the Scrutiny Committee, which otherwise voted overwhelmingly in favour. For CTC, Roy Spilsbury commended the decision, and said with the possible exception of one voting against, the others were predictable. He said there were several puzzling aspects which needed closer examination. Bikeability: CTC helps bring bikeability to North Wales and so gets more youngsters cycling. Click for press release. Llandudno Promenade Cycling Ban - CTC Protests: CTC has lodged a strong protest with Conwy CBC against the cycling ban on Llandudno's promenade. It cites systemic anomalies and a failure to take account of the hazardous road conditions for cycling on the adjacent Parade. The promenade is over twice as wide as the Parade - use Google Earth to take a closer look at this travesty. Barnardo's & Father's Day, Sunday, 20th June 2010: On your bike ride and barbecue from Pensarn car park - click for poster. National Cycle Route 5 (North Wales) - Upgrading Work Imminent: Work will commence in early January 2010 to provide a link for cyclists and pedestrians from the eastern end of the Penmaenmawr promenade to the Pen-y-Clip bridges. The scheme is expected to be completed by the end of March. This will be useful for both commuters and long distance riders following NCN 5 along the coastline. Those living locally may still prefer to use the parking congested, yet relatively quiet, Old Bangor Road. Hopefully in the near future consideration will be given to making this part of Penmaenmawr a 20mph zone. Help us find the descendents of Walter Dutton(1862-1909), Liverpool: Click to see the wonderful collection of Walt's cycling sketches from 1887. And have a peep at the sort of cycling he was getting up to at the time http://www.britishpathe.com/record.php?id=14668 . Walt's sketches include his brother Arthur Dutton. Arthur remained a prominent figure in the cycling world, and was still active in Liverpool until at least the late 1930s. What cycle activists have done in Weymouth, Llandudno will do when it is encouraged to wake up to the shame on its own doorstep. At last cycling will be allowed on Weymouth’s Preston Beach Promenade. Barrister Martin Porter, who blogs as The Cycling Lawyer, certainly thinks it is. In a recent post entitled Cycling Against Car Culture, Porter argues that our justice system is biased against cyclists. He draws on his legal experience to compare how the police, prosecutors and courts have dealt with both driving and cycling causing death. It seems that bad cycling is regarded as similarly dangerous as bad driving, though the latter causes many tragic accidents, whereas the number of pedestrians killed by cyclists is in fact only similar to the number killed by golfballs. And so this farce rumbles on. 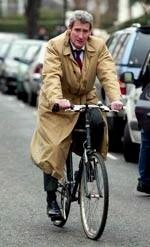 A spirited attempt by a young Llandudno Town Councillor to seek a rethink on the prom cycling ban failed last night. Conwy County Cllr Phillip Evans as usual led the opposition, even saying some people thought too much was being spent on cycle paths and that the money would be better spent elsewhere. Clearly he remains convinced he knows what is best for cycling - even though he repeatedly fails to heed its voice. Can you ride THE BICKERTON CHALLENGE in support of HELP 4 HEROES? It’s hard. Are you up to it? Click for details and entry forms. Llandudno, self-styled Queen of Welsh resorts, has delivered a slap in the face to cycling every bit as foot-stampingly spiteful as Blackadder's Queenie. Click for press report. Dismissing advice from cycling bodies who demand safe access along the town's north shore, Conwy CBC is proposing to direct National Cycle Route 5 around the perimeter of the town through some of its most unpleasant and dangerous roads, avoiding shops, hotels, guest houses and the magnificent Great Orme in the process - but, by way of consolation, providing a wonderful view of a breaker's yard. News Flash: The long-awaited cycle bridge at Conwy Cob and the underpass under the flyover and the cycle path to the RSPB reserve were opened on Friday 15th October 2009. See photo of your editor as the first cyclist to cross the bridge. Within the first couple of hours of this unannounced opening there were plenty of people exploring this delightful new route. We are certain it will be popular. 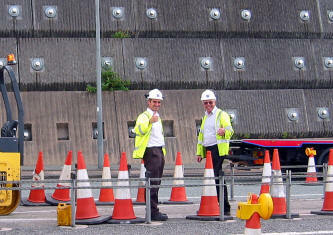 The Conwy Estuary 'rumble strip' has been re-surfaced and is also now open. Welsh Right to Ride victory: Sheila Jones, CTC’s Right to Ride representative for North Ceredigion, has won her campaign to improve conditions for cyclists on the A470, the Cardiff to Glan Conwy trunk road. The project director has agreed to provide a gateway feature that will define the 30mph limit in Newbridge-on-Wye, and that alternative routes for cyclists will be made of bituminous material. This represents a significant victory in improving conditions for cyclists along what is the main North-South road for Wales. Congratulations to Sheila! 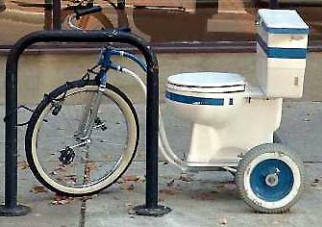 You cycle in heavy traffic? Hopefully this will become a regular thing, so if you can't make this one, but would like to know about future meetings, let Neal Hockley know at <n.hockley@bangor.ac.uk> and likewise if you have any queries. Cycle Instructor Forum: Cycle Instructors in Wales are to have the opportunity to establish a Forum that meets their needs, through a series of meetings across Wales. The first meeting will be held on 18th June in Colwyn Bay at the Interchange. Tea and coffee will be provided from 1 pm with a view to starting by 1.15 pm. Details of a South Wales meeting will be circulated shortly. If you are considering a gift for a country loving friend, why not buy a membership of the Society for them? You'll be doing them and yourself a huge favour. CTC DEMANDS IMMEDIATE REMOVAL OF CYCLE PATH POSTS: Many cyclists have complained about the irresponsible placing of heavy wooden posts within the boundary lines of the coastal cycle path near Pensarn (NCN Route 5). On Wednesday 13th May 2009 an experienced cyclist, familiar with this route, collided with one of the posts in very windy conditions. He sustained extensive injuries requiring surgery. It will be interesting to see how long the local authority, Conwy CBC, takes to respond to the CTC demand. To see the posts click here. Bob Clift Memorial Cheshire Cycleway Rides: SUNDAY 14th JUNE 2009. Click for Details . Carmarthenshire 26-27 March and 2-3 April. CTC Cymru AGM 08/09 - Your chance to help cycling in Wales: The CTC Cymru Annual General Meeting is to be held at 11am on Saturday 10th January 09 at the National Cycle Museum, Llandrindod Wells. All members of CTC are invited to attend. Present will be the new Training Officer for Wales, Gwenda Owens, who will be reporting on her first few months in post. The agenda will include the 2009 Welsh Festival of Cycling which is again planned for Rhayader, If you have time to assist with this or aspects of CTC Cymru's work in Wales, do come along to the AGM - you'll find a most cordial welcome amongst friends. As a special bonus for the day, your CTC membership will entitle you to free access to one of the finest collections of cycles and cycling memorabilia in the world. 'Cyclists and Pedestrians - Campaigning Together - Succeeding Together' ,was the theme of a day well spent by those who attended to hear the latest ideas on people-friendly town and city streets. The Al Gore of the Bike Trade in the USA? John Burke speaks on cycling from an American perspective. His message is universal. North Wales Chief Constable, Richard Brunstrom, speaks in support of greater cycle access to Snowdonia. New urban cycle path for Prestatyn: In a £1.4m scheme involving a rail crossing and link to the new Ysgol Clawdd Offa, Prestatyn will be adding to its urban cycling infrastructure. See the story here Note the open meetings at the school on Thursday, 6th November. Controversial Cycle Awareness Youtube video now given the all-clear: 'Sorry Mate I didn't see you!' is usually the first word cyclists hear after they have bounced off a car bonnet. It's now gained its own anagram - SMIDSY (see the internet for more). Conwy Estuary Cycle Route: Work is about to start on the link to the Conwy RSPB nature reserve via the estuary foreshore. This will involve using an existing service tunnel under the flyover on the cob and a cycle bridge over the main rail line. Different Worlds: Elsewhere on this site we have a page about the unfavourable comparisons a Dutch touring cyclist makes between cycling back home and here in the UK. The decision to order a feasibility study into developing the former 10 mile rail line will be widely welcomed..
CTC Cymru wishes to explore the options for developing cycle access to the Snowdonia National Park through integration with public transport. CTC Cymru is receiving a steady stream of reports from irate cyclists who have been prevented by local authority beach patrols from using Llandudno's North Shore promenade as an alternative to the traffic congested Parade. We would appreciate further information on such encounters, particularly if they involve elderly cyclists, families with young children, or companions where one has a mobility scooter and the other is cycling. Travelling by bike, and looking for a lightweight camping pitch? Cycling through Grief: Cycling can be therapeutic for so many human ills. Bernie Friend lost both his parents over a short period. He took to his bike and has written of his experiences along the North Sea Cycle Route. Sounds a good read and will help to raise funds for Cancer Research UK. Cycling - A Hot Potato in a town of Couch Potatoes: In a debate that has been described as the 'hot potato of cycling in Llandudno', Conwy County Cllr Philip Evans has admonished pro-cycling town councillors and local cycle activists, who are seeking to create the conditions in which cycling in the town will thrive. Cllr Evans is well known for back pedalling on cycling. In an attempt to circumvent entrenched vested interests opposed to promenade cycling, a working group has suggested allowing cycling on part of the prom, but then diverting cycle routing to a mixture of heavy traffic and back streets - just to avoid using a few hundred yards of promenade that is virtually empty for over 90% of the year. CTC Cymru has made it clear it does not subscribe to the view that cycling is a threat to promenading pedestrians (there is over twenty miles of adjacent successful coastline shared-use). It insists that either cycling is allowed on the full length of the prom, with cautionary signage where appropriate, or the Highway Authority removes all car parking in front of the hotels in order to provide two-way cycle lanes of adequate width. 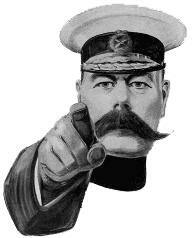 Calling all Anglesey supporters of cycling: A local CTC member asks if there any other local cyclists interested in joining him in helping to raise the profile of cycling on the island. He is particularly keen to help local government at all levels understand the needs of cyclists. Saucers may not fly, but a lot finish up in the sink after Alun Jones and his friends have passed by. Designing Space for the Bicycle - the intellectual abyss? Cycling provides some of the best views in the world - but also a close-up of the rear cleft of planners' minds. Llandudno North Shore Promenade Cycling Ban: With their myopic policy of giving higher priority to elderly/sedentary visitors than to those who wish to take gentle cycling exercise on Llandudno North Shore promenade, could it be there is a 'bottom line' compromise for Conwy CBC and the landowners, Mostyn Estates? 2 Audax Rides are being organised in 2008 by Chester & North Wales CTC: for details click here . Whether a cyclist or not, if you have a view on cycling in Wales, why not cast an eye on the CTC Cymru Cycling Forum. You don't have to be a member of CTC - just someone who sees the immense personal benefits of cycling. You can make new friends, or keep in touch with riding pals of old. You can also get the latest news on the annual Welsh Festival of Cycling. Or you can let us know what you think about Welsh Transport Policy and its obscure strategy on cycling. Will Matthew Parris of THE TIMES face the music on piano wire? What does it take to bring some newspaper columnists to their senses on road safety? A few months ago the Chief Constable of North Wales, Richard Brunstrom, at a private meeting with the press showed an image of the decapitated head of a motor cyclist killed riding at high speed. He sought to engage those present with the reality of what is a part of the job of traffic police officers, firemen, hospital and mortuary staff - and even clerks in the coroners' and solicitors' offices. But for those present there was a far better story to be had - finding yet another opportunity to roast Brunstrom himself because he had failed to obtain the consent of the family involved. The national press had a field day and two MPs recently called for Brunstrom's resignation - the purpose for which his original meeting had been convened being completely forgotten. Just published by the Warrington Cycle Campaign. An expose of the sort of crazy cycle lanes we have to cope with in the UK. . There is reason to believe there is popular support for a blanket restriction in all residential areas throughout the UK. Climate Change - why not be a Cycle Hero? A news story of high drama with a happy ending. If only.......! See the story, and wait for the film of Graeme Obree's remarkable conquering of the One Hour World Cycling record. CLICK HERE. 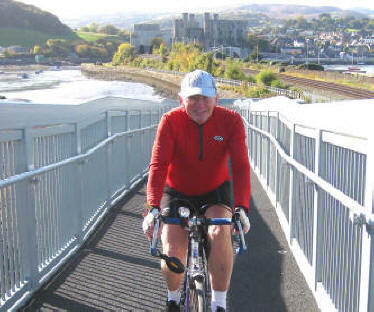 North Wales Police - in touch with the community pulse by bike: Politics apart, there is some regret in the world of cycling at the loss of Alun Pugh from the Welsh Assembly Government. A cyclist himself, Alun knows what it's like to handle a bike in traffic, and has always been sympathetic to its problems and enthusiastic for cycling's social aspirations. 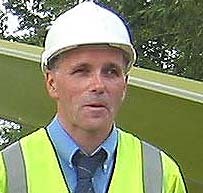 Alun lost his West Clwyd seat by a small majority to Darren Millar (Con) who has yet to prove any understanding of life in the saddle and the need to promote cycling for all manner of reasons. But it looks as if Darren may be pushing off on the wrong foot. Asked what he thinks about the proposal to issue North Wales police with electric assisted pedal bikes, he is reported to have said, 'I'm not convinced people are asking bobbies to be on bikes - they're asking them to be on the beat'. 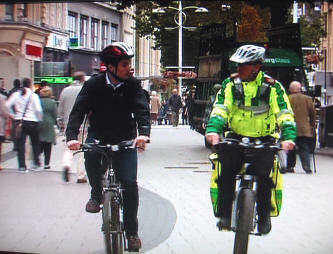 Has Mr Millar not realised that being on a bike is 'being on the beat'? Cyclists are part of the community like everyone else. Not to be discriminated against and socially excluded. As any cyclist will tell him, a constable using a bike will intuitively survey far more ground while on the lookout for trouble makers - and also be more readily available to the public at the hailing of a voice - than ever he would be driving a car or plodding the slabs. By two votes to one, the Appeal Court has overruled an earlier High Court judgement which had previously found in favour of London's Critical Mass. This gives the police greater powers of control - but how effective this will be remains to be seen. Jenny Jones, a Green Party member of the London Assembly, said: "This decision is bad news for everyone. It will end up with the police wasting time arresting innocent cyclists. It will be like arresting a group of passengers for gathering at Westminster tube station during the rush hour." Jenny is urging as many people as possible to join her on the ride this Friday (25th May 2007), which sets off at 6.30 from under Waterloo Bridge, by the National Film Theatre. Click here for the London Critical Mass website. The cycling world in the UK is deeply concerned about a draft change to the Highway Code. This would reduce protection for cyclists using a section of road with a cycle path in the vicinity, even when the use of the road assists the nature and purpose of their journey. Motoring & Traffic Offences - can the press be trusted to report responsibly? 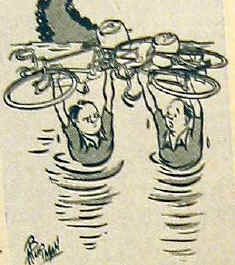 The cycling world has for almost a century complained of the way the press trivialises drivers' misconduct on the road. This leads to 45,000 serious injuries or deaths each year in the UK . Richard Brunstrom, Chief Constable North Wales, agrees. In aiming to explain why the Arrive Alive scheme is so important for the safety of all road users, he invited the press and media to a private conference. In demonstrating what emergency workers have to face on a daily basis, he showed graphic photographic images of a decapitated motor cyclist. He stressed there were no plans for the pictures to be released to the public, but indicated that the permission of the relatives had not been sought for their use on the day. At least one conference member released the story for publication. As a result calls are now being made for Brunstrom to be dismissed. For further details see the report in THE TIMES and the response from Brunstrom himself. A substantial contribution to reducing the impact of motor travel would be made if it were safer and more pleasant to cycle on the roads. This would open up a far more socially inclusive dimension to countryside access, as an alternative to viewing the scenery from the inside of a car. Illustrated is an example of a specially adapted bus for carrying bikes. 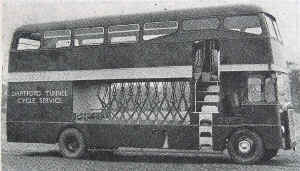 It was used in the 1950s to access Dartford Tunnel, Kent. It accommodated 23 bikes in racks and 33 passengers with light luggage. In addition to standard racks there was space provided at the rear for tandems, tricycles etc. CTC believes there is a strong case for promoting bike buses as an alternative to using cars for accessing some of the most popular recreational cycling destinations. Wirral attraction tops a UK visitor chart: Like many urban areas, if you know your way around, you find quiet and pleasant places to delight the eye and ear. Such an area is the Wirral Peninsula. And such an oasis of peace and tranquillity, the village of Port Sunlight, home to Lifebuoy and Lux Toilet soap. Its magnificent Lady Lever Art Gallery has just been polled by the Association of Leading Visitor Attractions (Alva) as having, at 71%, the highest increase in visitors during 2006. Denbighshire County Council - Coastal Cycle - infrastructure: Cllr Eryl Williams, Denbighshire Cabinet Member for the Environment, has announced that a Welsh Assembly Transport Grant of £2m has been used to upgrade paths for cycling and walking in Rhyl, Prestatyn, Dyserth, Rhuddlan and Bodelwyddan areas. With transport representing 22% of carbon energy emissions, it is clearly the responsibility of all levels of government to encourage carbon neutral travel - and that's the bottom line with cycling. The next step? What about a traffic-free community route linking Rhyl to Ruthin, with the tantalising prospect of linking Bala and Dolgellau Ever heard of Lon Clwyd? Our 'Frivolous Travel' is Destroying the Planet: The founders of Lonely Planet have condemned as "frivolous" British travellers who fly to European cities with no real sense of purpose. Tony and Maureen Wheeler, who started the global guidebook company after a pioneering trip across Asia 35 years ago, have been speaking at an annual travel industry event. Little did they know that one day their enthusiasm for global travel would threaten the very planet itself. Cycle tourism makes least impact, but even then, if air transport is used for long hauls, its contribution to the degradation of the environment and rising sea levels cannot be discounted. For further on 'frivolous travel', click here. Cycle Access to Llandudno North Shore: Many will be wondering whether there is any news to report of the complaint lodged by CTC Cymru against Conwy CBC. This alleged social exclusion of cycling in the North Shore area of Llandudno. That so few cycles are seen in this most popular part of town is a clear indication of the intimidating traffic conditions that discourages cycle-use. An Inconvenient Truth - Climate Chaos: Al Gore's Oscar nominated documentary on Global Warming 'An Inconvenient Truth' is to be shown in all Secondary Schools in England. What about Wales ? We have already questioned on this site whether the right generation is in charge of their future. 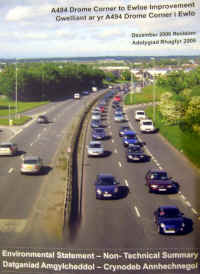 With new road building in Wales pressing ahead as if we don't want a future for our grandchildren, (Drome Corner, Queensferry et al), and 'honey pot' planning sending traffic volumes through the roof, the Welsh Assembly must declare without delay how it aims to reduce both traffic and carbon emissions. Which is where cycling can play a crucial role in persuading people out of their cars (60% of journeys are 5 miles or under). Jeremy Paxman, BBC TV interviewer of true grit fame, accuses the corporation of hypocrisy in regard to its carbon footprint policy. Well known for leaving a footprint about one and half inches wide as he cycles around London on his business, Paxman is one of the latest high profile figures to challenge society's laissez faire approach to carbon emissions. For story CLICK HERE. 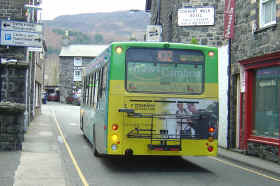 Cycles on Buses: Where journeys are undertaken in the mountainous and less populated parts of Wales, using a cycle in conjunction with public transport is important for some users. We would like to hear of your experiences, good and less good. Your attention is drawn to Traveline Cymru web page and the section dealing with cycles. Cycle Carriage Buses operating on services X32 and X94 are equipped with racks which can carry a maximum of two bikes. The facility is available on a first come, first served basis. Bikes can only be loaded or unloaded at certain points - these loading/ unloading points can be found here . Please, let's hear from you. Zak Carr Sentence: Top UK cyclist Zak Carr (30) was killed when a car driven by a publican Donald Pearce ploughed into him as he was cycling to work. The driver was convicted of causing death by dangerous driving and sentenced to 5 years imprisonment. It was said in evidence that Pearce had not slept since leaving Turkey the previous day, and it's believed he fell asleep. The incident occurred in October 2005 near Wymondham on the A11. In a statement, CTC Campaign & Policy Manager Roger Geffen said, 'Although this sentence is reasonable within current sentencing guidelines, it is still only a fraction of the maximum sentence available - the reason isn't too hard to spot. Despite the new Road Safety Act 2006 the sentencing framework for bad driving offences is still riddled with inconsistencies. If the driver had done exactly the same thing but by chance Zak Carr had 'merely' been maimed rather than killed, the maximum sentence the judge could have given him would have been just 2 years. So it is hardly surprising that judges never go anywhere near the maximum of 14 years open to them in cases such as this when someone is killed. The government must sort out these anomalies if sentences for dangerous drivers are to reflect the gravity of threatening other road users lives'. Wearing a Helmet puts cyclists at risk, research suggests. See the interesting study undertaken by the University of Bath. Click here. 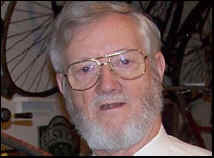 'Our David' awarded an MBE: Mentioned in the 2007 Queen's New Years Honours List, is David Higman, curator of the National Cycle Collection at Llandrindod Well. David has been awarded an MBE for services to tourism. He currently has c.250 machines on display, some dating from 1818. Well worth a visit. David's enthusiasm for his subject is deliciously infectious - and he doesn't mind spreading it around. Well done David! For a story about a particularly interesting and unusual artefact click here . Pavement Cycling: Daily the roads of the UK are becoming more congested. As the frustration and agitation of motorists increases, so many parents will be wondering where they stand legally by instructing their children to cycle only on the pavement. For a considered view CLICK here. How right GBS was about cycling and public prejudice: 1925 Nobel Prize Winner for Literature, George Bernard Shaw (1856-1950), observed that newspapers were unable to discriminate between a bicycle accident and the collapse of civilisation. If anyone should have known, he should. Aged 94, and in his final year, he renewed his membership of the Cyclists Touring Club! You may not agree with everything David says, but he's smack on target with the ludicrous Llandudno promenade cycle ban. For the second time running, Conwy CBC's Cabinet committee has 'kicked into touch' cycle access along the North Shore promenade as an alternative to the white knuckle ride between the prom paddling pool and Prince Edward Square. The antique promenade byelaw bans cycling, but seemingly permits every other activity under the sun - including a recently observed 4X4 towing a boat at 20mph. 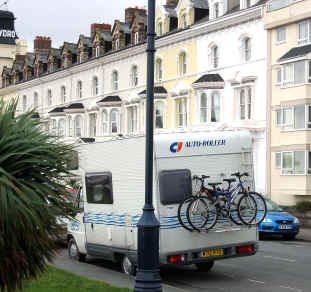 Make no mistake about it - the battle for Route 5 of the National Cycle Network running along the prom is not over yet. But common sense might prevail even sooner if you wrote to the North Wales Pioneer or North Wales Weekly News. Or let your local councillor know your views in no uncertain terms. To keep in touch with his life as a leading supporter of all road users taking responsibility for their behaviour on the road CLICK http://www.north-wales.police.uk/nwp/public/en/blogs/ . Note for anyone who writes to support Richard's comments through the North Wales Police web link: don't forget to mention nearby Pen y Clip, which is arguably even more horrible than the section of NCN to which he refers. A reminder of what that's about may be seen by clicking here. 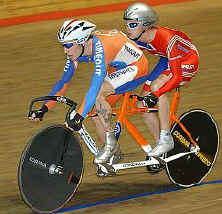 No doubt the debate on the value of the cycle helmet will continue to rumble on amongst a largely ill-informed public. For a interestingly balanced view we recommend you have a look at the above site. A case of helmets being more froth than foam ? THE NATIONAL TRUST & GREEN TRANSPORT: The National Trust wants to promote the use of public transport, cycling, and walking; not just on a daily basis, but also when visiting Trust properties. Did you know there are 230 Trust properties within 2km of the National Cycle Network? Many of these offer incentives to encourage car-free visits. Bus and ferry services and cycle routes provide alternative ways of arriving. At many properties discounts are offered if you choose these methods of access. New caterer at Aber: Meeting a need for good grub, the Caffi Yr Hen Felin fills the gap on Route 5 NCN between Llanfairfechan and Bangor. It will be useful for mountain bikers, ramblers, and tourists exploring the North Wales coast. A community regeneration project serving fresh home baking and good coffee, this must be well worth supporting. You are assured of a warm welcome from Debbie Waymen and her staff. Tele 01248 689454 if you require further information. Insurance company backs down: When cyclist, Mr Green, died of head injuries following a collision with a car, the motorist was found solely at fault for driving without due care and attention and was fined £200. Subsequently the driver's insurance company, Direct Line, wrote to Mr Green's widow saying that because her late husband was not wearing a helmet, it would reduce her compensation by 15-20%. Faced with the prospect of having the case reviewed on a recent edition of BBC Radio’s Money Box programme, Direct Line has backed down in its efforts to reduce Gill Green's compensation. In order that cyclists involved in claims for compensation are not intimidated by insurance companies, it is absolutely vital that they have access to good legal advice. All CTC individual members can get free cycling-related legal advise by calling 0870 873 0062. Successful Cycle Promotion at modest expense: The Warrington Cycle Campaign's website has a fascinating illustrated report on how Hilden, Warrington's twinned town in Germany, has successfully popularised cycling in recent years without spending large sums of money. A Welsh First for Cyclists: The first UK Traveline website to cater for cyclists combining their journey with bus and rail services. The site lists all-year and seasonal services and conditions for carriage, and includes links to CTC and Sustrans websites for additional route information. Thanks to Heledd Jones of PTi Cymru for this first attempt at delivering cyclist information. Note – for timetables you go to Timetables page and type in the numbers given – no direct link from Bikes web page … yet. Fancy a 'Back to Nature' cycling holiday on the Scottish Borders? At the Albert Watson Memorial Hut (beside A701, 10k south of Broughton) for £3 a night you can stay beside the Quilt Burn near Tweedsmuir with a friendly pub about half-a-mile away. Self-catering, gas cooking, coal heating, basic sanitation, newly-installed running water supply (shared with adjacent cottage) – boil before drinking. Duvets provided, sheet sleeping bags needed. Twelve beds in two rooms, plus small ‘leader's room’, living-room and Scullery. There must be at least one adult CTC member in the party. Phone Ashley Watt (0131 440 1495) for more details and to book.